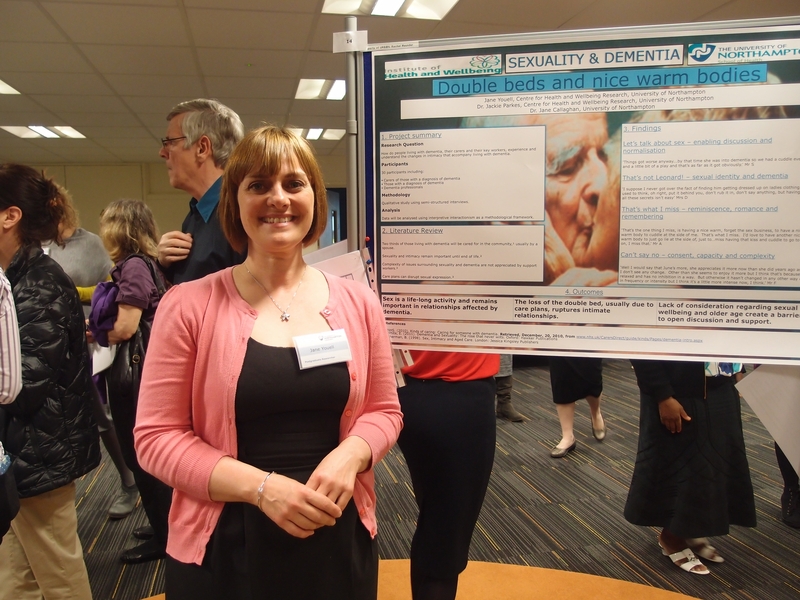 On the 7th May, at the Graduate School Annual Poster Competition, Jane was awarded the winning prize of £100 for her poster entitled “Double beds and nice warm bodies”, describing her research into sexuality and dementia. Jane graduated as a mature student in 2009 when she was awarded a first class honours degree in Psychology. Jane continued to work within the School of Social Sciences as a Principal Student Mentor before embarking on her PhD research within the Institute of Health and Wellbeing. She has a particular and personal interest in autism spectrum conditions, carer issues and mental health. As an undergraduate Jane produced a dissertation which investigated the changes in intimacy in long-term relationships when one partner has dementia. Following on from this early work Jane felt that there was scope for a larger project which involved those with a diagnosis of dementia and not just their carers. With the support of her supervisor’s Dr Jackie Parkes (Health) and Dr Jane Callaghan (Psychology) Jane embarked on her PhD project. This research is now in the final months of completion and has yielded rich data which offers insight into the lived experience of dementia and how this affects close marital relationships. Three strong themes emerged from the data around home space, sexuality and resilience and relational coping. Jane hopes to continue working on dementia related research projects after completing her doctorate. She hopes to be able to combine this work with some community based project work. Jane can be contacted at the Institute of Health and Wellbeing at the University of Northampton. Posted on May 22, 2014, in Events, Researcher careers, School of Health and tagged Dementia, Jane Youell, Researcher Biography, Sexuality. Bookmark the permalink. Leave a comment.